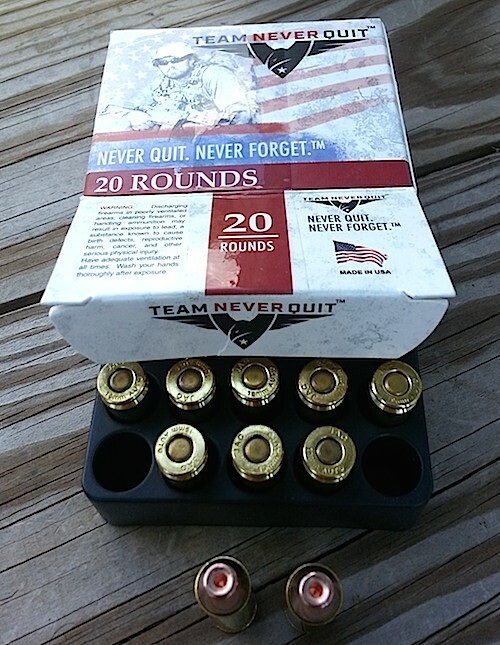 This is first installment in a series of posts on the Team Never Quit 10mm ammo, beginning with the 125 gr. frangible round. This ammo was ammo advertised on Cabela’s and anything with Marcus Luttrell’s name on it is going to garner attention. I decided to start with something I’ve only fired a few times in the past, namely the frangible hollow-point ammunition. The marketing line is that this product serves a dual purpose as both training and self-defense ammunition. I can definitely see the range benefits and have used frangible ammo in a limited context in CQB rifle drills on steel plates in the past. The defensive aspects of the ammo were a bit more difficult to buy, although the secret service and air marshals supposedly use it under certain circumstances. The benefits are supposed to come from reduction in potential collateral damage. Imagine a situation where persons are at risk from a ricochet or a miss that penetrates a hard surface such as a door or glass. The ammo must somehow perform reasonably well on a soft target, but break apart/disintegrate on a harder surface. Sounds kind of like magic. Actually, there is science behind the round’s performance, but the key point to understand is that the bullet is designed to heavily fragment ONLY when it strikes a surface harder than itself. I did not have enough ammo in the first round of testing for a comprehensive analysis, but I was able to penetrate 3/8″ plywood with relative ease. Here is an article that takes the 9mm frangible through its paces and makes some very relevant observations. Now, what about self-defense performance on a soft target? From what I’ve been able to gather, TNQ uses Sinterfire frangible bullets and there is an online gel test of 10mm 125gr. frangible. Here is the video and the test gun is a 4.5″ EAA Witness. The effect on the gel block (through denim) is pretty impressive. As you would expect from a high-velocity, light round, most of the energy is dumped into the target in the early part of the wound track, if you can call it that 🙂 It almost impresses me as setting off a small grenade inside the target. Two fragments penetrated about 9 1/4 inches. Impact velocity was recorded as 1700 fps. I got a 5-shot average of slightly under 1600 (using a friend’s chrono) on a day with temps in the low 80’s and just under 50% humidity, so I might expect slightly more penetration, but likely under 10″. I used a G20 with a 5.3″ Barsto barrel. So, can you accept 9-10″ penetration from a couple fragments along with a baseball-size ‘explosion’ inside the target? I can see a couple security situations where I might want to be loaded with one mag. of this ammo (along with a couple backup mags of 180gr. Gold Dots). For general defensive situations, I’d probably recommend that people look into the heaviest HST round you can load and effectively shoot from your defensive pistol. In terms of the quality of the ammo, it shot just as impressively as its packaging and its company name. It cycled perfectly and felt very consistent, shot to shot. I would have no issue carrying this ammo for situations in which I felt the expected circumstances justified its use. I do, however, plan to purchase a couple more boxes of this ammo and perform better testing on penetration of hard surfaces. Since the company also sells the 10mm 155gr. solid copper hollow points, that will be the subject of a future test of the TNQ ammo. Thanks for spending part of your day with Texas Gun Show Review.